“They’re lit up,” she wondered how I could be so oblivious. I was often oblivious. She was often oblivious too, taking for granted all the things that Japanese take for granted. Of course yozakura were lit up. You couldn’t even see them otherwise. And why wouldn’t we want to go see them at night? They’re so pretty. Somewhere I got addicted to living here. I had grown more in two years in Japan than twenty six in Virginia. Via Skype in my parent’s computer room, the first Englishman I’d ever spoken to asked me where I wanted to live in Japan. Big city, small city, or country? My town had 200,000 people, and it wasn’t country. I didn’t think so anyway. I later found out that the population of my hometown was spread over four times the area of the small city I was inevitable sent to, having just given my permission to the pleasant Englishman to send me there. Seemed that by Japanese standards, I was a country bumpkin. By American ones I’m just southern. Because it’s not home, it’s just where I live. It’s the same for a lot of expats, many of whom are on their seventh year of saving up. “For what?” I asked, and after knocking back a few sips of Japanese beer they mumble something about going back to college. It’s hard to admit you’re settled, because the trade off for habitual instability is that you can always fall back on the fact that you’re just preparing for something bigger and better. You’re future is out there, you just haven’t gotten around to it yet. In the meantime you’re a long-term tourist. That though, has its benefits. When you’re out there in foreign time and space, life never loses its novelty. Local is never local. There’s always something that your eyes haven’t adjusted to the locals pass over without a second thought. I had heard Kose Sports Park mentioned in association with cherry blossoms before, but it had been quite clear that it was nothing but a local pride spot, somewhere you might visit because of an impressive highway billboard. But that’s where Japan’s marrow is. It’s not at Sensoji, terminally touristy and bunkered behind squadrons of ready souvenir stands. It’s the abandoned shrine on the winding mountain path, its dirty banner fallen and its only clergy in the surrounding graves. So Kose Sports Park was my first time to see Yozakura. 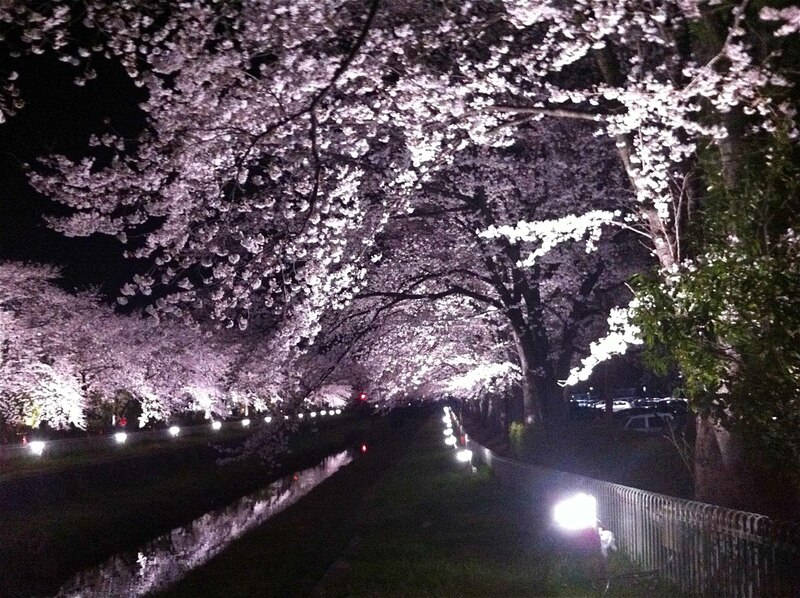 The cherry blossoms were lit up stunningly along the bank of the canal, violet-white and delicate as sugar at night. As we strolled hand in hand down twin lanes of sakura, I remembered the plum blossoms that bloomed just weeks before, already withered. It was ukiyo, the floating world. Life was impermanent, beauty and pleasure hazy lanterns in a long evanescent string of nights. A professor emeritus whose class I took but whose name I’ve forgotten told us the ancient emperor could at any time sign a decree declaring all debts of nobles canceled. When your business could be yanked out from under you with a stamp of the imperial seal, you learned to live in the moment, because tomorrow it may all be gone. And in ukiyo, we held hands under a night sky of cherry blossoms, leaving our worries on the bank to float aimlessly down a river of lights. What a beautiful picture! These are so much prettier than Washington D C’s cherry blossoms. What is the best time to see them? Cherry blossom season starts around early April here, though a bit earlier farther South and later farther North. They are only at full bloom for a few days though, so you have to keep up with the news to know when is the best time to view them.